Woo hoo! You are about to rock your profits! 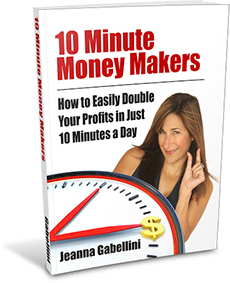 I’m delighted that you just grabbed a copy of 10 Minute Money Makers: How to Easily Double Your Profits in Just 10 Minutes a Day! PC Users — right click the link and choose “Save as”. MAC Users — click the link and hold down the mouse button . This eBook is in PDF format and requires that you have the Adobe Reader installed on your computer. You may go here to download it for free. Thanks again for your purchase. If you have any questions or comments, feel free to contact my team: info at Masterpeacecoaching.com.